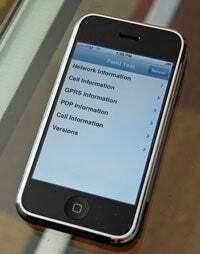 Richard Baguley, chief cellular ninja over at WirelessInfo.com, just published a number that, when called, turns your iPhone into a mobile field testing station. Suddenly, up pops a new menu (as you can see on our own iPhone at left) that provides detailed reporting on strengths and characteristics of the cell towers in your area, plus a load of other nerdy networky factoids. In other words, you can see things that AT&T might not want you to see. What's cool is that you can even enter field test mode during a call just by tapping the iPhone's "Add Call" icon, then the field test number. But before I give you this magic number, it is my duty to share Richard's warning.